Grady Tripp is an English professor who has spent the past seven years writing his novel Wonder Boys. As the story opens, a writing conference is taking place on the campus where he works. This means that his editor is en route and will want to know the progress of his book. It also means that Grady will be expected to hobnob with his students at the chancellor's house, which might be easier if he wasn't having an affair with said chancellor right under her husband's nose. Oh, and his wife just left him on top of everything. Grady and company set off on a madcap adventure complete with a stolen car, a dead dog, and a Passover celebration that doesn't go quite as planned. The plot is interesting and your drive to keep reading basically becomes your disbelief that Grady can, in fact, dig himself out of these enormous problems he has created for himself. But the characters were disappointing to me. There are moments when Chabon seems to be trying too hard to make his characters outrageous. There is constant pot smoking. Grady is apparently interested in every woman he encounters and his editor appears to be attracted to every man who crosses his path. Unfortunately, that propensity to push the characters farther and father makes them seem unrealistic and unlikable. Wonder Boys is a book that you really have to read to believe. Grady Tripp is one of the craziest characters I have yet to discover on a page, but that didn't mean that he was a character that I loved. 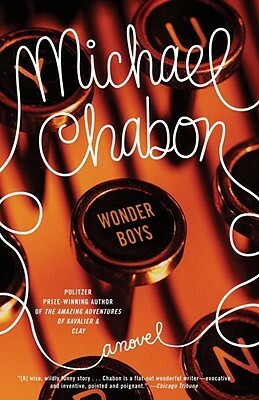 Chabon is a great writer who crafts beautiful sentences seemingly effortlessly and takes his readers on amazing adventures. I just missed the whimsy and warmth that can be found in some of his later books. I had similar feelings about the movie based on this book. I haven't read the book, probably because I didn't like the movie all that much...sounds like I might be able to pass altogether. Glad to hear this isn't representative of his other work! The first two of his novels that I read are still my favorite. I keep hoping that another one will match them but it hasn't happened yet! I would definitely recommend Kavalier and Clay or the Yiddish Policeman's Union. It's Monday and it's almost Christmas? It's Monday and I have a winner!